I use a size K (6.50 MM) hook for everything except the eyes and nose. For those I use an F (3.75 MM) hook. *First chain does not count as a stitch unless otherwise stated. Rnd 9: With fur color, jn with a sl st where you fastened off in round 8. Ch 2, 5dc cluster in same st, dec, (5dc cluster, dec) around. Jn with sl st.
Rnd 10-12: Ch 2, dc in same st, 5dc cluster in next st, (dc, 5dc cluster) around. Jn with a sl st in first dc. Rnd 11: Ch 2, 5dc cluster in same st, dc in next st, (5dc cluster, dc) around. Jn with a sl st in first dc. Fasten off fur color. Rnd 12: Jn body color with a sl st where you joined Rnd 11. Working in back (inside) loops only, dc in same st and around. Jn with sl st. Fasten off leaving tail long enough to sew neck to head. *Beginning chains do not count as a stitch unless otherwise stated. Rnd 11: Ch 2, double crochet decrease around. Jn with a sl st in first dc. Stuff the head and sl st to close. 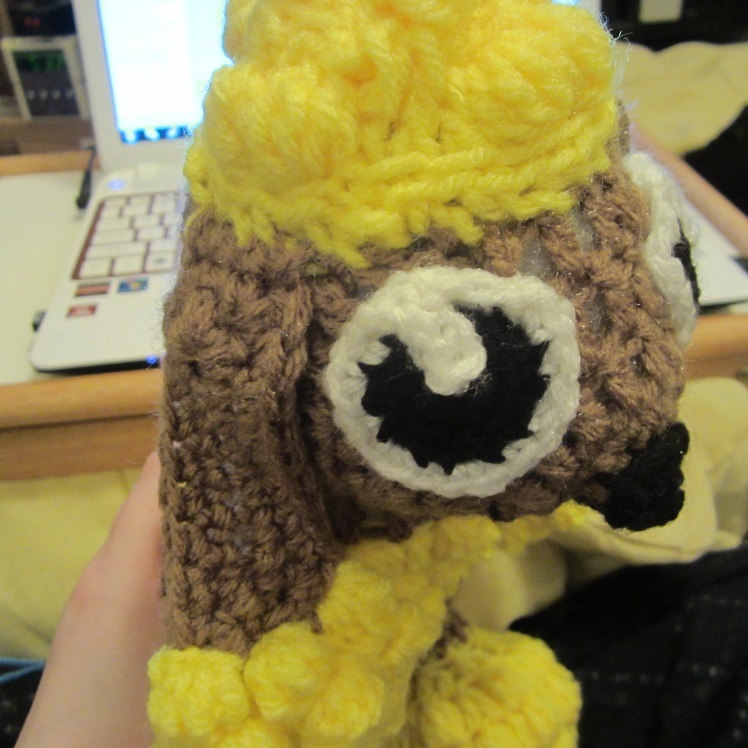 I usually sew on eyes and nose before closing the head so it’s easier to weave the ends inside the head. 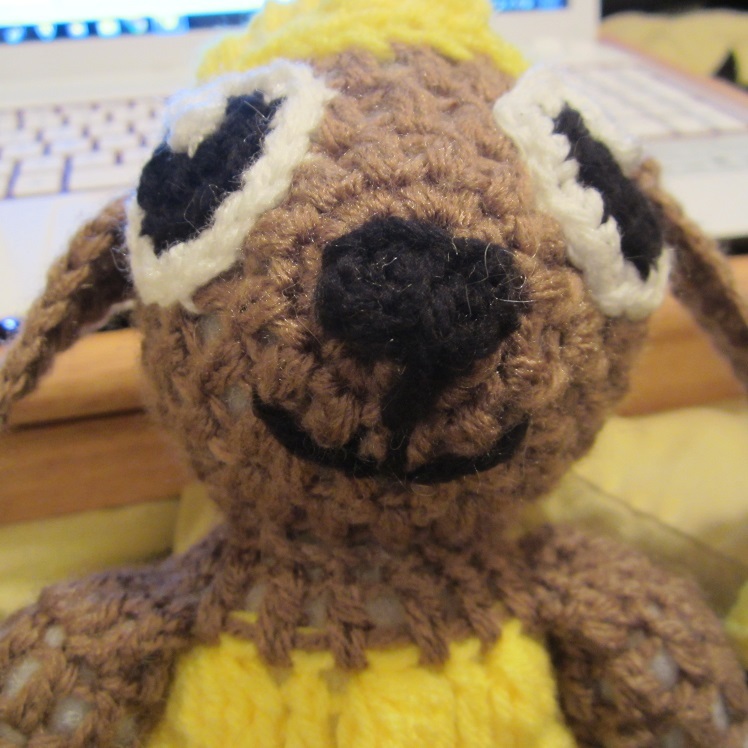 Use an F (3.75 MM) hook and black yarn for the nose. *There are 2 pieces that you’ll sew together. Rnd 1: Ch 3, 3dc cluster in 3rd ch from hook, 2 dc, (3dc cluster, 2 dc) three times. Jn with a sl st.
Rnd 2: Ch 2, 2dc in same st, 5dc cluster, 5dc cluster, (dc three times in the next st, 5dc cluster, 5dc cluster) around. Jn with a sl st.
Rnd 3: Working in back (bottom of top knot) loops only, ch 1, sl st in same st. (ch 1, sl st in next st) around. Jn with a sl st in first ch. Fasten off leaving tail long enough to sew puff to the top of the head. You’ll sew this one to the center/top of the bottom round to make it a little taller. Rnd 1: Ch 3, 5dc cluster in 3rd ch from hook, 2dc, (5dc cluster, 2dc) three times. Jn with asl st. Fasten off leaving tail long enough to sew this puff to the bottom puff. Rnd 2: Working in back (bottom of top knot) loops only, ch 1, sl st in same st. (ch 1, sl st in next st) around. Jn with a sl st in first ch. 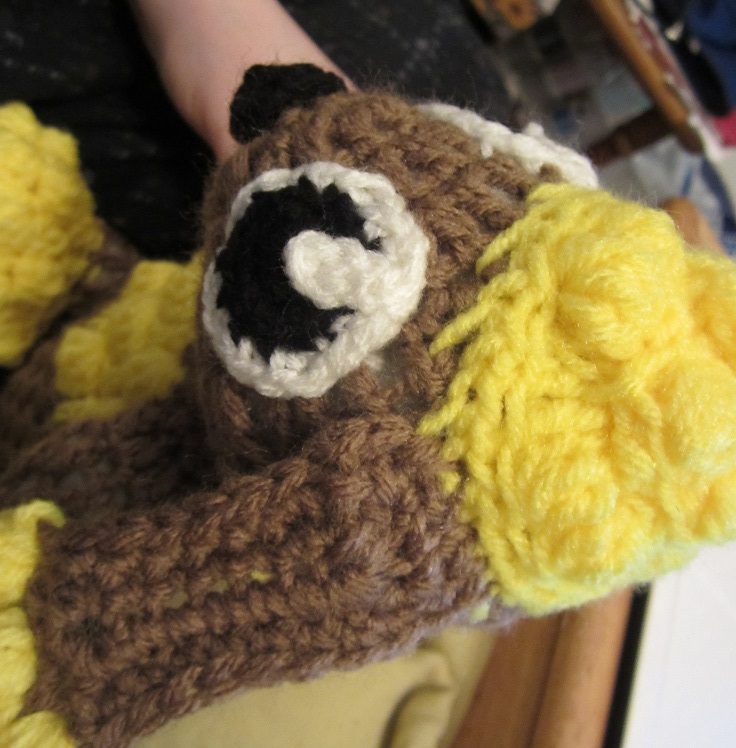 Fasten off leaving tail long enough to sew puff to the top of the head. Rnd 1: With body color, Ch 3, 8 dc in 1st chain. Jn with sl st in 1st dc. (8 dc not counting 1st chains.) Fasten off body color and jn fur color in same spot. Rnd 4: Ch 2, beginning in same st as ch-2, dc dec around. Jn with sl st in 1st dc. (8 dc decrease stitches not counting first ch-2.) Fasten off fur color and stuff paw. Rnds 6-10: You can stuff as you go along if it’s easier for you, but I never have any trouble stuffing it at the end. Ch 2, dc in same st and each st around. Jn with sl st in 1st dc. 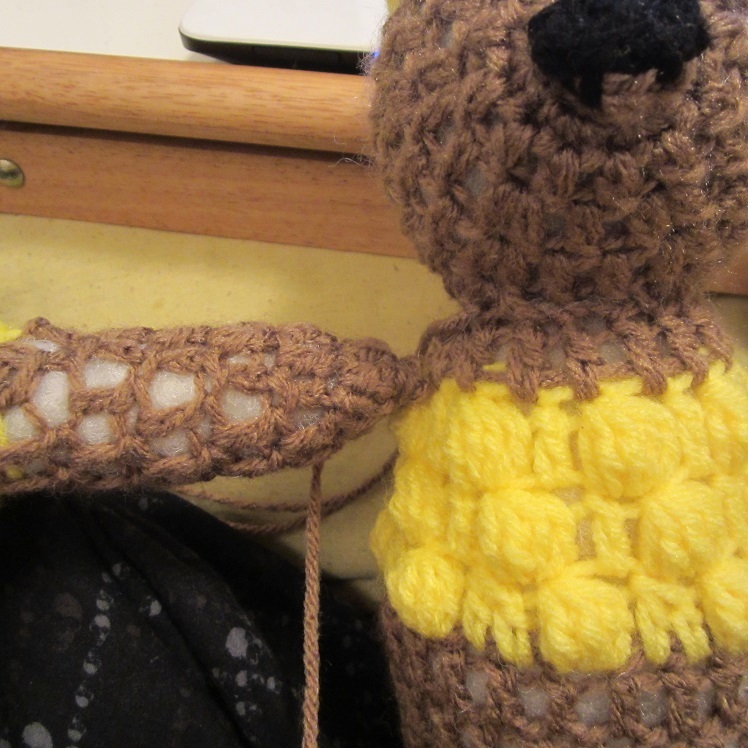 After round 10, fasten off leaving tail long enough to sew arm to body. 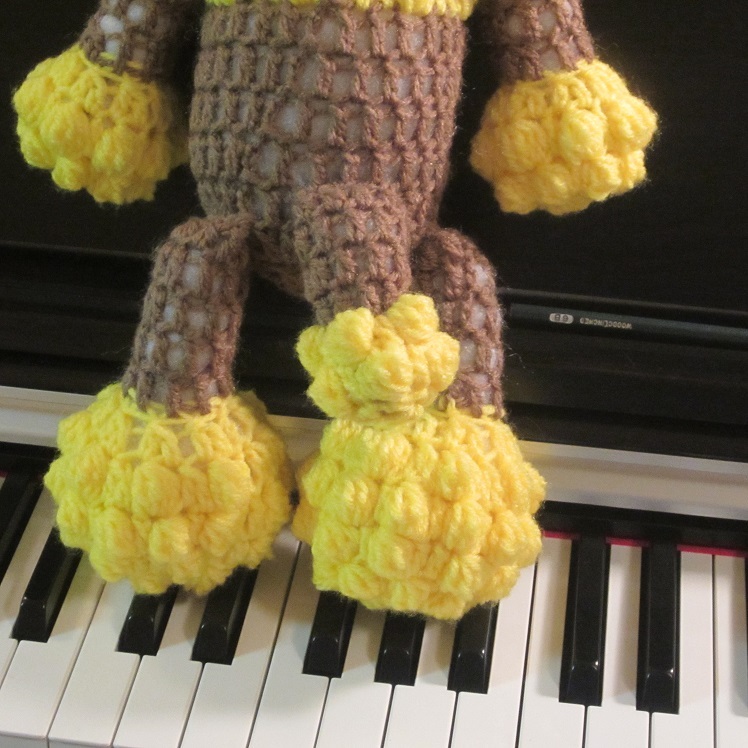 I like to pinch the top of the arm together and then sew it on so that it will be floppy. If you sew the limbs on in a circular fashion they will be stiff. Do whichever you prefer! Rnd 1: With body color, Ch 3, 8 dc in 1st chain. Jn with sl st in 1st dc. (8 dc not counting 1st chains.) Fasten off body color and jn fur color with a sl st in the same spot. Rnd 3: Ch 2, (dc, 5dc cluster) in same st. *Dc in next st, (dc, 5dc cluster) in next st. Repeat from * around. Jn with sl st in 1st dc. Rnd 4: Ch 2, 5 dc cluster in same st, dc in next st. (5dc cluster in next st, dc in next st) around. Jn with sl st.
Rnd 5: Ch 2, 5dc cluster in same st, dec, (5dc cluster, dec) around. Jn with sl st.
Rnd 6: Ch 2, dec around. Jn with sl st in 1st dc. (8 dc not including 1st ch-2) Fasten off fur color and jn body color with a sl st in same spot. Rnd 8-11: Ch 2, dc around. Jn with sl st in 1st dc. (8 dc not including 1st ch 2.) After last round, fasten off leaving tail long enough to sew leg to body. Rnd 3-4: Repeat Rnd 2. Fasten off body color after Rnd 4 leaving a tail long enough to sew tail to body. Tail, tail, tail. *snort*. Rnd 5: Flip the tail so that you are working in original chain side. Jn fur color with sl st in any ch. Ch 2, 5dc cluster in same st, dc, (5dc cluster, dc) around. Jn with a sl st.
Rnd 6: Ch 2, dc in same st, 5dc cluster in next st, (dc, 5dc cluster) around. Jn with sl st in first dc. Rnd 7: Ch 1, sc decrease around. Sl st to close. Fasten off, stuff and weave in ends. Rnd 1: With body color: Ch 8, sc in 2nd ch from hook and in next 5 chains, (sc, dc, sc, sc, dc, sc) in the last chain pivoting the chain as you go along so that you can work back up the chain. Sc back up in the next 5 ch, (sc, dc, sc, sc, dc) in the last (or very first, rather) chain. Jn with a sl st in the very first sc. Rnd 2: Ch 1, sc in same st and next 7 st, (dc, sc) in next st. (This should be the stitch right after the dc from Rnd 1.) Sc, (sc, dc), sc in next 8 st, (dc, sc) in next st, sc, (sc, dc) in next st, jn with a sl st in first sc to close round. Fasten off leaving a tail long enough to sew ear to head. For the bottom, ‘fluffy’ part of the ear, attach fur color with a sl st to the corner of one side of the bottom of the ear. This round will the right side, or the row that should face up when you’re finished. On the other rows remember to push your bobbles backwards (in-side-out) so that they’ll face up. You’ll be working in those bottom 5 stitches. Row 1: Ch 2, 5dc cluster in same st as join, (sc, 5dc cluster) twice. Row 2: Ch 1, turn. Sc in same st, 5dc cluster, (sc, 5dc cluster) twice. Row 3: Ch 2, 5dc cluster in same st, (sc, 5dc cluster) twice. Row 4: Ch 1, turn, (sc, dc, sc) in same st. *Sc in next st, (sc, dc, sc) in next st. Repeat from * one more time. Ch 1, sl st in last st. Fasten off and weave in ends. Ch 8, sc in 2nd ch from hook and across. Ch 1, sl st in last ch, pivot, ch 1, sc in same st and back up chain. 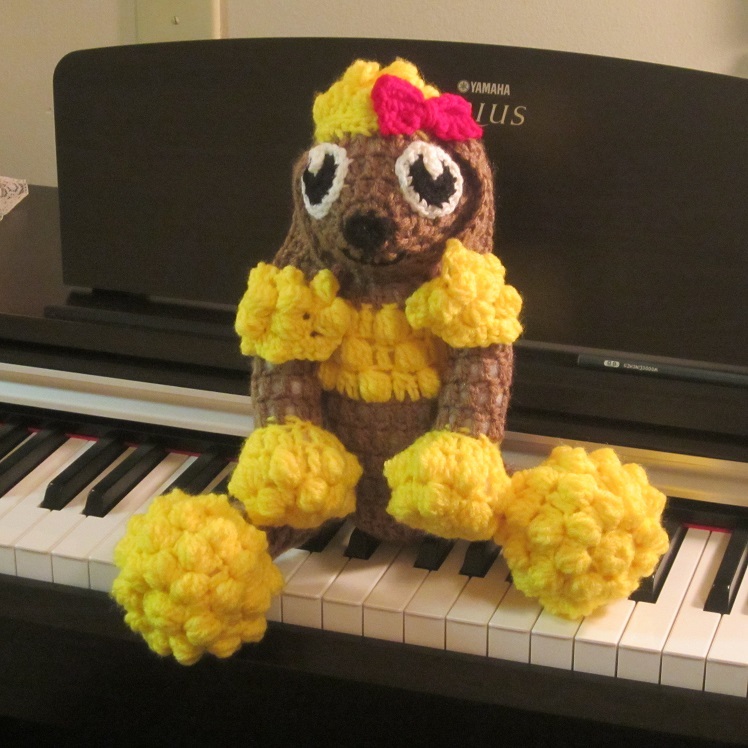 Ch 1, turn, sc in same st and across so that you now have 3 single crochet rows. Fasten off leaving tail long enough to weave into bow and wrap around the center before you sew it onto the head. 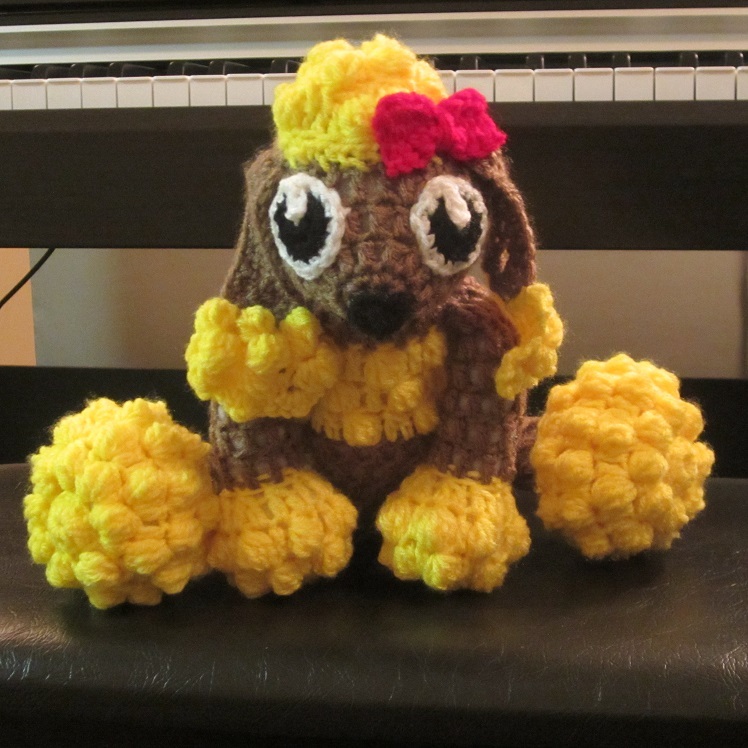 Sew everything together and weave in all the loose ends! 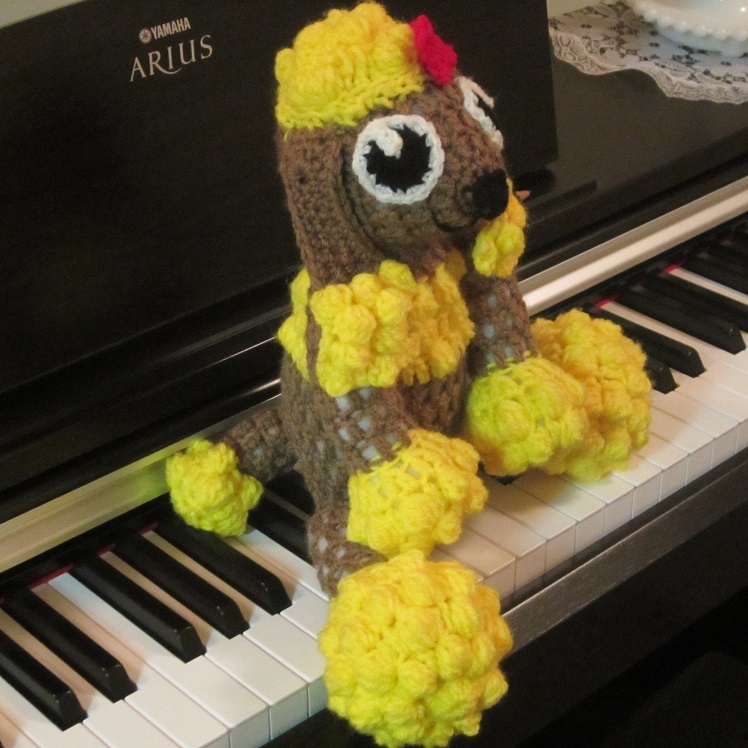 Now you have a poodle pal! 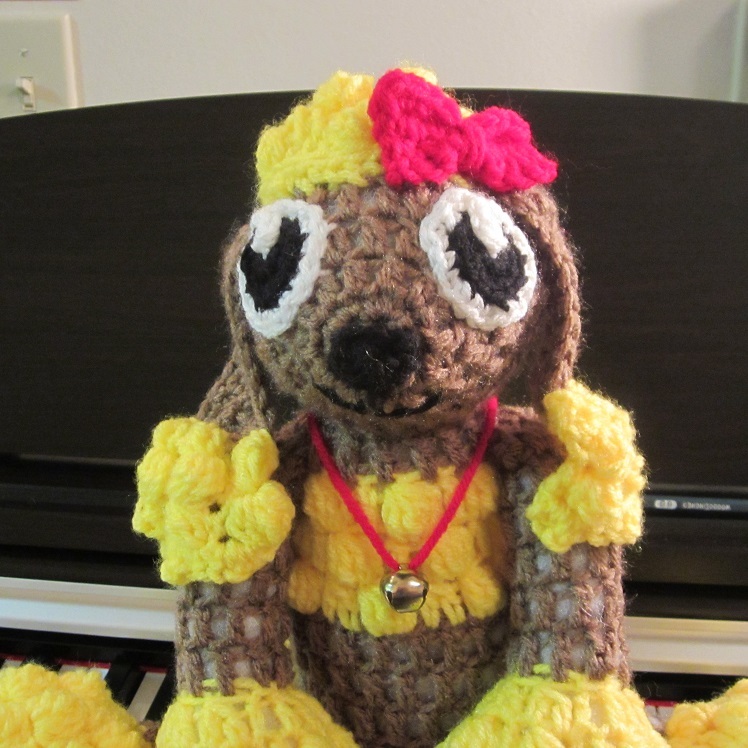 This entry was posted in Uncategorized and tagged adorable, anime eyes, bark, bobble, Craftyghoul, crochet, cuddle, cuddles, cute, dog, doggie, doll, free, Free Pattern, hug, huggable, pattern, poodle, puppy, softie, softy, Starling, top knot, woof. Bookmark the permalink. Oh my, so cute. It looks so much smarter than the real ones i use to know also.